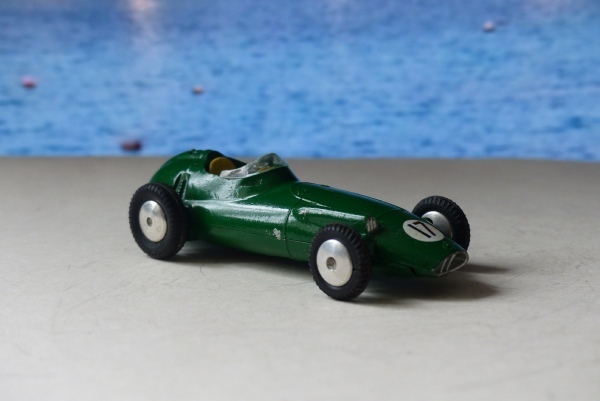 Here is the 1957 BRM as it was originally issued by Corgi in British Racing green and with no driver. It’s a very basic model which didn’t really appeal to me at the time but now I can see these very first models o have a certain charm. This has some excellent paintwork, including good silver paint on the nosecone detail, what I think is a light and the exhaust at the side. It also has the original RN17 entirely intact. The steering wheel is there and the window too, although that has been very slightly chipped along its top edge. What looks like a chip on the side is actually a small factory silver brush mark. There are few of these around now in this sort of condition as most got well raced around the room or bumped around on a transporter. All the 152 models are this shade of green. Some have the criss-cross style of cast wheel. This one has base text in line with the body. There is an alternative that runs across in short lines.